Your child has grown up and it is not anymore a baby. You might be moving your child from a cot to a bed or readapting their space for a young student about to start “big school”. Children are unstoppable, happy, creative, and have their own personality, likes and dislikes and you should definitely take these in consideration when upgrading your child’s bedroom. What to choose: bright colours and modern designs or a more traditional, soft and classic style? Your child’s bedroom should now interact with your child and take him or her to a wonderland where all their dreams can come true, sometimes in a very small space. 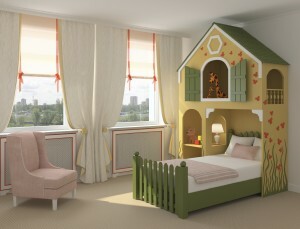 There are many different things to be considered when designing a little child’s bedroom. They want to draw, race, sleep, play, study and much more. By now your little one probably has accumulated a lot of belongings. Space and storage starts to become a big issue and there is never enough space. The planning and space design for your child’s bedroom is extremely important to make the most of your space and manage clutter. … and the cow jumped over the moon can design not just a beautiful and comfortable bedroom for your child but will make sure to accommodate all their little things, solve storage concerns and encouragement development.